As a physiotherapist in practice in Toronto for over 12 years now at MATRIX Toronto Physiotherapy, I have seen patients suffer from all types of painful injuries and conditions. Many of these conditions are most painful in the early stages of occurrence (Acute Phase), and the pain associated with it diminishes over time through the rehab process. 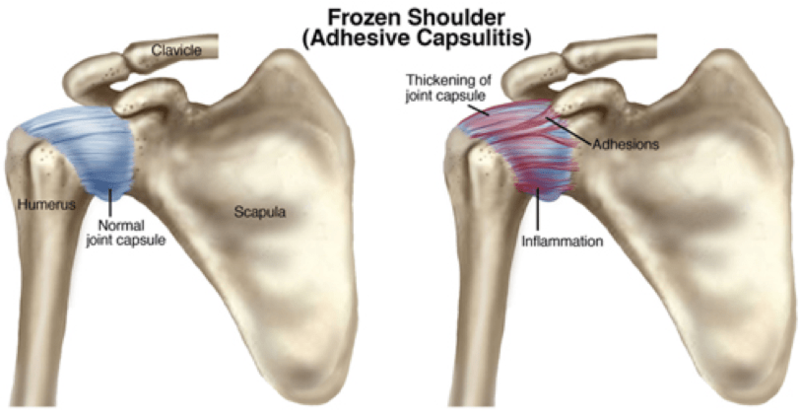 One of the conditions that break this typical pattern is a Frozen Shoulder or Adhesive Capsulitis. The joint capsule is a thin film or tissue that surrounds the entire shoulder joint that holds the structures together giving it increased stability. When the joint capsule becomes inflamed, the tissue can become thickened and shoulder movements become very stiff, painful, and restricted. Pain is the key word! There are many theories as to how this inflammation starts but the consensus is that it develops from a period of self-limiting behaviour due to pain or injury to the shoulder. Over a period of weeks to months, the capsule loses its ability to stretch and the shoulder becomes STUCK and very painful to move. I put it into perspective for my patients by explaining that if I put their unaffected “Normal” shoulder in a sling for two months, they would likely develop a frozen shoulder on that side even free of injury or pain to start with. If a patient is given proper education to maintain full shoulder ROM through a series of rehab exercises early in their injury or pain episode, they would never develop a Frozen Shoulder. Much of the literature on Frozen shoulders describe various stages of recovery and extremely long expected recovery time-frames. I strongly believe these guidelines apply to those who are not actively and persistently working on their shoulder movements with a very aggressive physiotherapist. As long as all other pathologies have been ruled out such as tears, rips or fractures, the shoulder joint needs to be mobilized with a great deal of force in order to stretch out the ceased up joint capsule at ANY STAGE OF RECOVERY. The major issue is PAIN! Everyone’s tolerance to pain is different and the manual joint mobilization sessions are extremely painful, and many of the home exercises to promote more movement are extremely painful. The patient MUST understand and accept that the high degree of pain is a part of the recovery process and that no HARM is being done despite the agonizing pain. Over the years in my practice, the patients who have allowed me to deliver the high necessary force to stretch the capsule and who actively participate in their home-based exercises have all regained near full active shoulder range of motion in 2-4 months. This is not a judgement on those who just cannot tolerate the pain because pain is a very Primitive Response designed to help protect us. I usually do not even begin to discuss strengthening exercises with my patients until they have regained at least 75% of their active ability to move their shoulder. I want my patients to focus their time and attention on getting more movement. Strengthening weakened muscles is an easy straight-forward process as long as they perform the prescribed strengthening exercises somewhat regularly. The shoulder will get stronger as well just from increased ability to use it for daily activities once the functional range of motion has returned. If you suspect you have a frozen shoulder or if you have been given such a diagnosis by your doctor, do not be discouraged. You should not scare yourself by the proposed extended recovery time-frame. You should actively seek an aggressive physiotherapist to work on the shoulder with you right away rather than believing that Frozen Shoulders get better on their own in 12-18 months as commonly stated in the literature.